Show 315 of The Engaging Brand leadership and marketing podcast is ready just for you. To subscribe or listen for free, you don't need to download anything and all explained at the end of the post. Why do humans become addicted and is cyberoverload different to other types of media addiction such as TV. How our brains are wired for a low tech world. 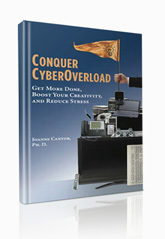 Does Cyberoverload happen due to avoidance of work or feeling inspired? How do you learn to recognise when to take a break? A new way of thinking of taking a break - because it IS actually working! How to be a workaholic and asleep! How it is not just about quantity of information but also what type of information you are consuming. The connection between cyberoverload and human needs which it may be filling. Don't forget to subscribe to the show in iTunes or on the Blubrry site. If you have feedback for me on the show or topics that you would like me to cover then e-mail me at anna@theengagingbrand.com or join me on twitter. Can brands can be social "Brands cannot be social" a challenge at a social media marketing workshop today... I don't agree. I believe brands should be social, I believe brands can be social but neither of these draw the conclusion that brands are always social! Brands are only as social as the people who develop them...if you are not social then the brand is unlikely to be social± I often talk in training sessions about how people shop, if they had a shopping angel on their shoulder...what would that angel provide? This leads to how brands can be social Ø Speak to a real person about the product or service Ø Offers, giveaways or promotions - help me get the best value Ø Chat with other users about how they have found it Ø Information and data, help me understand the product/service Ø Ability to share the information or recommend it to a friend Ø Learning how to… That is the S.O.C.I.A.L aspect. I don't see which of the above cannot be provided by a brand, either on their website or on other sites (For example: You Tube ) Social is not 'an add on to a marketing campaign' - it is something that you live day by day, social is a mindset not a technological tool. How NOT to Focus on Customer Service Customer service is so critical to brand success and yet the phrase has become far too functional, far too transactional. Customer interactions are emotional, they are emotional because They involve human beings! Purchases create or satisfy emotional needs in some way. When I work with leaders on customer service, often it is because of how they are leading their people and how they are measuring success. Let me give you an example i often use to illustrate the problem "Bob Pittman of 6 flags entertainment found that the janitors were surly with customers. He went undercover and found managers were ordering that the parks were kept immaculate. The janitors therefore saw customers as a problem, as they were stopping them from achieving their objective. Pittman changed the objective to keeping the customers happy and since a dirty park would make their time less enjoyable, they cleaned it up but in a friendly manners." Objectives can create focus but make sure that the focus is on the right thing!